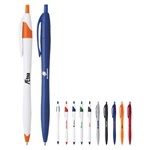 At LogoToYou.com, you’ll find a huge variety of promotional pens. Not only do we offer high-quality plastic, metal, and gel products, but our entire range comes at affordable prices. Marketing your business has never been easier! Logo Imprinted Deauville Pen is made of 100% plastic material. Personalized Logo Ballpoint Pen with Rope is made of 100% plastic material. Custom Imprinted Clic Stic Bic Pen is designed with click-action mechanism. Promotional Logo Parc Ballpoint Pen is made of 100% plastic material. Personalized Logo Tropic Pen is made of 100% plastic material. Promotional Logo Imprinted Nash Pen is made of 100% plastic. Customizable Logo Collins Pen is made of 100% plastic material. 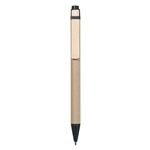 Logo Imprinted Three-Sided Metal Pen is made of 100% Lacquer-coated brass. Personalized Ice Imprinted Clic Stic Ballpoint is designed with click-action mechanism. Customizable Logo Clic Media Bic Pen is always available in stock. Custom Cyprus Imprinted Gel Pen is designed with plunger-action mechanism. Customized Cougar Pen with Rubber Grip is made of 100% plastic material. Logo Imprinted Eclipse Pen is made of 100% plastic material. Logo Imprinted Gill Pen is made of 100% plastic material. Personalized Karma Pen is made of 100% plastic material. Custom Double-Trouble Logo Pen Highlighter is made of 100% plastic material. Promotional Logo Westin Pen is made of 100% plastic material. Promotional Logo Mayflower Pen is made of 100% plastic material. Logo Imprinted Carousel Pen is made of 100% plastic material. 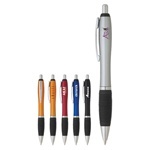 Personalized Logo Rounders Ballpoint Pen is made of 100% plastic. Promotional Logo Cypress Pen is made of 100% plastic material. Promotional Dual-Tip Logo Pen Highlighter comes with chisel-tip yellow highlighter. Logo Imprinted Tremont Pen is made of 100% plastic material. Logo Imprinted Nash Pen Highlighter is made of 100% plastic material. Logo Imprinted Dual-Tip Highlighter Pen comes with click-action ink cartridge. Promotional Logo Imprinted Viking Pen comes with wide contoured shape. Promotional Logo Imprinted Carabiner Highlighter features functional comfort. Personalized Bay Triangle Ballpoint Pen comes with retractable ballpoint. Custom Retractable Beatz Highlighter features internal closures for extended refill life. Personalized Sticky Notes Logo Highlighter features one-color highlighter. Custom Logo Tango Gel Ballpoint Pen is made of 100% plastic material. Customized Dash Gel Logo Pen is made of 100% plastic. Custom Logo Lutz Gel Ballpoint Pen is made of 100% plastic pen. Customizable Logo Elements Gel Ballpoint Pen is made of 100% plastic material. Personalized Logo Harlem Pen comes with click-action mechanism. Logo Imprinted Jasper Pen comes with retractable ballpoint. Custom Printed Marx Pen comes with twist-action mechanism. Personalized Kennedy Ballpoint Pen comes with click-action mechanism. Personalized Logo Seville Pen features twist-action highlighter tip and pen. Logo Imprinted Jefferson Pen comes with click-action mechanism. Personalized Logo Mandarin Pen comes with silver brushed pearl finish. Promotional Galaxy Series Logo Ballpoint Pen comes with twist-action mechanism. 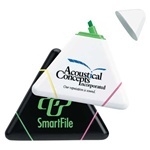 Logo Imprinted Tri-Highlighter features chisel-tip pink, green and yellow highlighters. Personalized Tri-Highlighter with Logo features chisel-tip three highlighters in green, pink and yellow. 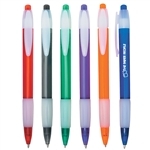 Promotional Round Stic® BIC® Ballpoint comes in more than 600 trim/barrel color combinations. Custom Round Stic® Ecolutions® BIC® Ballpoint is made from pre-consumer 76% recycled plastic. Custom Digital Clic™ Media Grip BIC® Ballpoint is designed with click-action mechanism. Custom Media Clic™ BIC® Ice Ballpoint comes with unique retracting mechanism. Custom Clic Stic® BIC® Grip Ballpoint Pencil is designed with dimpled soft rubber grip. 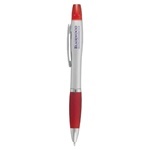 Logo Imprinted Clic Stic® BIC® Ecolutions® Ballpoint is made from 65% recycled pre-consumer plastic. Personalized BIC® Clear Tri-Stic® Pencil is designed with click-action mechanism. Custom Tri-Stic® Ecolutions® BIC® Pencil is made from pre-consumer 73% recycled plastic. Custom Foam Grip Tri-Stic® BIC® Pencil is designed with click-action mechanism. Custom WideBody® Grip Tri-Stic® BIC® Pencil is designed with three-sided white barrel. Bic Customizable WideBody® Tri-Stic® Grip Pencil is made from pre-consumer 71% recycled plastic. Customizable BIC® Pivo® Logo Pencil is designed with slim, sleek profile. 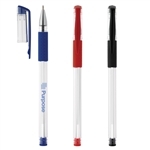 Promotional Clear Chrome Pivo® BIC® Pencil features retractable twist-action ballpoint. Custom Clear Gold Pivo® BIC® Pencil comes with retractable twist-action ballpoint. Personalized BIC® Pivo® Gold Pencil features retractable twist-action ballpoint. Custom BIC Clic® Ballpoint Pencil is made from renewable 26% plastic resource. Promotional Clear Clics® BIC® Ballpoint is made from renewable 26% plastic resource. Promotional Clear Clics® BIC® Gold Ballpoint is made from renewable 26% plastic resource. Custom Imprinted Clic® Gold BIC Ballpoint Pencil comes with gold-plated polished nickel. Promotional BIC® WideBody® Ballpoint is designed with click-action mechanism. Promotional WideBody® BIC® Ecolutions® Ballpoint is made from recycled 72% pre-consumer plastic. Bic Custom imprinted WideBody® Grip Ballpoint comes with contoured soft rubber grip. Promotional WideBody® BIC® Clear Ballpoint w-Ice Trim is always available in stock. Custom WideBody® BIC® Message Ballpoint Pen is available with stock messages. Custom BIC® Message WideBody® Ballpoint is designed with click-action mechanism. Personalized Chrome Grip WideBody® BIC® Ballpoint is designed with chrome-finished trim. Personalized Color Grip Digital WideBody® BIC® Pencil designed with click-action mechanism. Custom Digital WideBody® BIC® Message Pen is designed with click-action mechanism. Custom Chrome Digital Widebody® BIC® Grip Ballpoint features click-action mechanism. Custom Logo Velocity® BIC® Gel Pencil comes with vivid, smooth gel ink. Custom Imprinted BIC® XXL Ballpoint Pen is designed with extra-large wide profile. Promotional Grip Roller BIC® Ballpoint comes with textured, comfortable rubber grip. 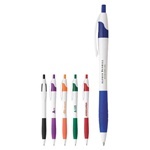 Logo Imprinted Z4®+ BIC® Ballpoint Pen features free-ink supply technology. 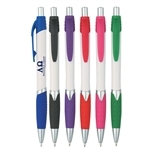 Promotional 4-Color BIC® Pen w-Lanyard comes with four ink color for one pen. Personalized Two-Sider™ BIC® Pen-Highlighter comes with dual-action mechanism. Promotional Brite Liner® BIC® Grip Highlighter comes with bright barrel. Custom Imprinted Brite Liner® BIC® Grip Highlighter comes with bright ink colors. Bic Personalized Grip XL Brite Liner® Highlighter offers broad highlighting with chisel tip. Custom Great Erase® BIC® Whiteboard Marker is designed to use on glass, non-porous surfaces and dry erase boards. Personalized Mark-It™ BIC Permanent Marker comes with comfortable, soft rubber grip. Logo Imprinted Color BIC® Connection Pencil comes with large imprinted area. Customizable BIC® Solid Pencil comes with white eraser. Logo Imprinted Clic Matic® BIC® Pencil is Scantron certified. Personalized Logo BIC Matic® Pencil is Scantron certified. Custom Media Clic™ BIC® Mechanical Pencil comes with large imprinting area. Custom Logo Printed Cruze Pen is designed with plunger-action mechanism. Promotional Logo Printed Dart Pen is designed with plunger action mechanism. Custom Logo Printed Vista Pen is designed with plunger-action mechanism. Personalized Logo Simplicity Pen is designed with plunger-action mechanism. Personalized Logo Printed Easy Pen is designed with plunger-action mechanism. 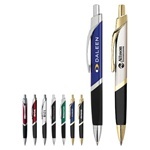 Personalized Logo Expression Printed Ballpoint Pen is designed with cap-off style. Custom Logo Printed Geo Pen is designed with plunger-action mechanism. Personalized Logo Printed Kingston Pen is designed with plunger-action mechanism. Promotional Logo Imprinted Fino Pen is designed with plunger-action mechanism. Personalized Logo Tahoe Pen features plunger-action mechanism. Personalized Logo Imprinted Sassy Pen is designed with plunger-action mechanism. Promotional Recycled Bottle Oasis Logo Pen is made from PET material. Custom Printed Logo Bellair Pen comes with plunger-action mechanism. Personalized Logo Eco-Friendly Pen is designed with plunger-action mechanism. Custom Logo Printed Terra Pen is designed with plunger-action mechanism. 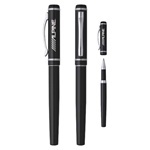 Personalized Expression Logo Gel Pen is designed with clear barrel. Custom Logo Plunger Action Gala Pen features translucent milky finish. Custom Logo Printed Essex Pen comes with plunger-action mechanism. Promotional Logo Printed White Sierra Pen features sleek design. You can choose from various ink colors, and place your order online in just a few clicks of the mouse.Writing implements printed with your business’s logo are ideal as marketing giveaways at conventions, tradeshows, and other corporate and community events. These products are the perfect way to advertise your company and help you expand your market reach. Hand out these items to potential clients and leads to ensure you’re on their mind every time they jot down a note. Give them to your staff to help present a professional, cohesive sense of brand, whether they’re in the office or on the road. No items are more useful than promotional pens. Whether at work, helping to fill out forms at an expo, or popping in the bag to take with you, our variety of products and elegant designs can be presented to potential customers, staff, directors, vendors, and valued clients. Whatever you need, we’re sure to have the perfect choice for your branding. Some of our more exclusive styles make for an elegant party and wedding favors, or as stocking fillers for the holidays. Choose from classy designs or funky colors in your choice of shade, and team with specialized printing for a thoroughly customized item. Pick promotional pens that will match your event décor or complement your style. Have names, dates, or quotes engraved, and use these handy products as mementos of a special occasion. Hotels, restaurants, and resorts will love our vibrant range of promotional pens for their guests’ and customers’ use. If you’re looking to establish your company’s brand, this is the choice for you. Whether you place them across the reception area, in guest rooms, or in the boardroom, there’s no doubt these items will see a lot of use. They make for lovely keepsakes, too, reminding your guests of their great experience and prompting them to share it with others. Take a look at our comprehensive range of styles, sizes, and colors—including capped or retractable options—and place your order today. Get your FREE samples today and take a closer look at our affordable, high-quality pens and discover how they can help your campaign. I received my order today. I am very pleased with the the artwork and of course, the quality of the pen. I was pleased with the pen when I received the sample. I will definitely order from you again when that time comes.